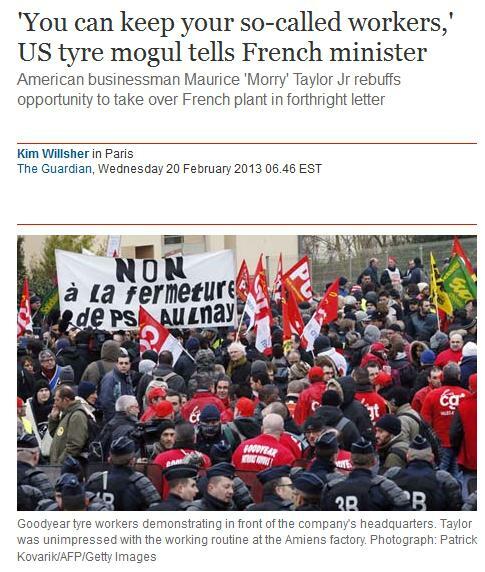 US Tire Mogul to Leftie French Minister: "You Can Keep Your So-Called Workers"
The CEO of US tire company Titan International, Maurice “Morry” Taylor, blasted French so-called workers in a letter to the left-wing industry minister. In the letter, published in the French media, Taylor said he would have to be stupid to invest in a French tire plant where union workers are working only three hours a day. The CEO of a U.S. tyre company has delivered a crushing summary of how some outsiders view France’s work ethic in a letter saying he would have to be stupid to take over a factory whose staff only put in three hours work a day.